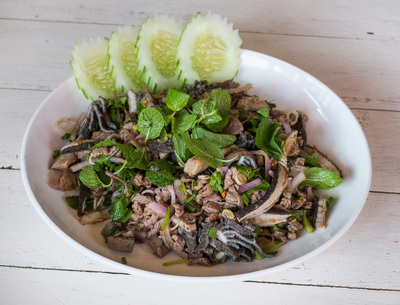 Laap, the most emblematic of Laotian cuisine dishes, is a minced meat or fish salad mixed with fresh herbs and lime. It can be made with different types of meat (beef, pork, chicken, buffalo) or fish and can be eaten raw - dìp or cooked - sùk.The main ingredients, ever present in various versions of laap, are aromatic herbs (mint and coriander), roasted and pulverized glutinous rice , chili and lime juice, while garlic is used only for fish laap. It is a tasty, fresh and light dish, normally served with a big plate of salad, mint and other herbs, all accompanied by sticky rice. Laap is prepared especially during weddings as a symbol of good luck as the word itself, besides meaning spiced meat, also takes on the meaning of good fortune or success. 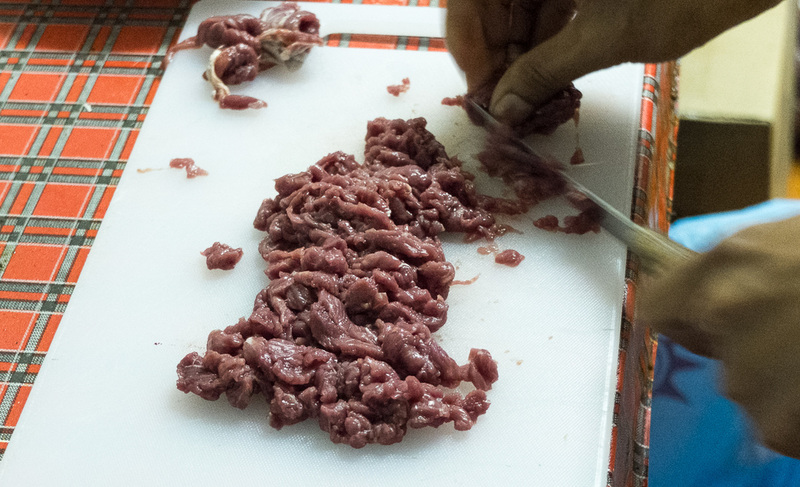 Our beef laap recipe here is the traditional version that includes use of offal. However, for the picky ones, I'm sure that this dish will be just as delicious if you only use a piece of lean skirt of meat. First we’ll prepare the tripe. Put some water and lemongrass (2 stems) to boil with tripe for half an hour or until it softens. Next we’ll toast the rice in a frying pan over medium heat until evenly brown color is obtained. 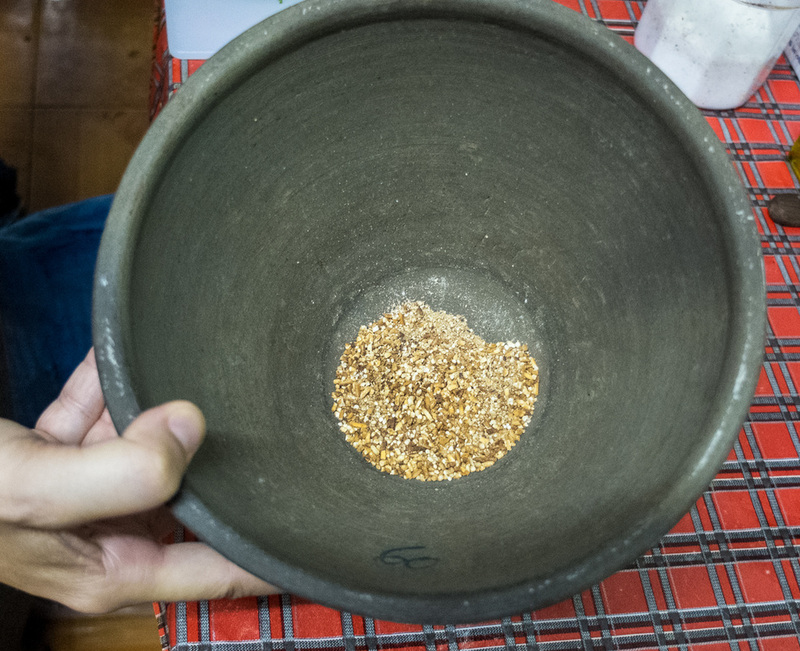 Then the toasted rice is pounded with a mortar to get a fine powder (alternatively you can use a mixer). Next, finely slice the spring onion, red onion and the rest of the lemongrass. 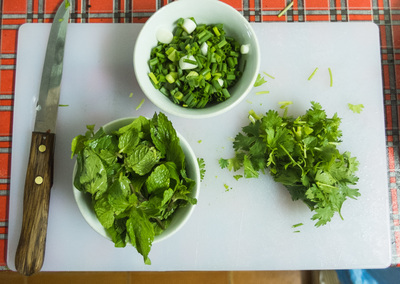 Rinse the mint and cilantro and gently strip off whole leaves. Mince and chop the meat finely with a knife. Once tripe is done, rain the water and slice it finely. N.B. save the drained water for cooking the meat in it. 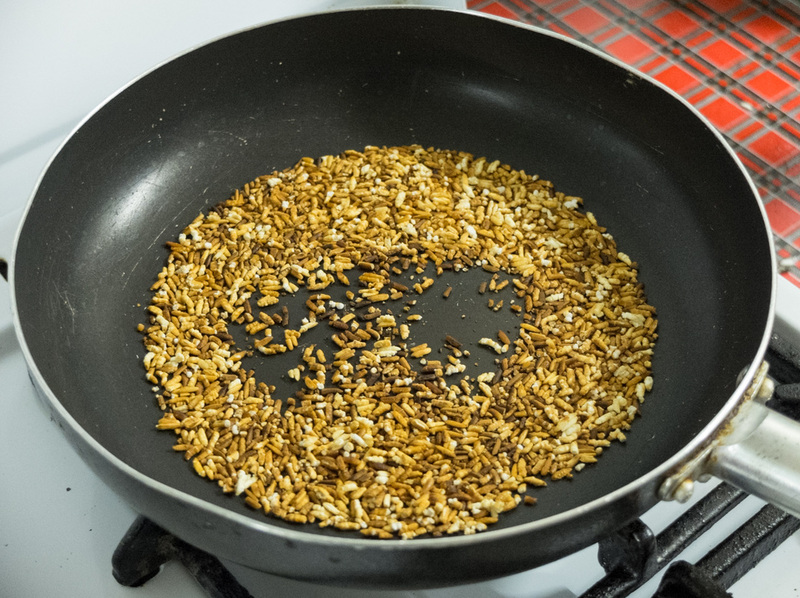 Now that we’ve prepared all the ingredients, we can assemble our laap. Sear the beef and diced liver in the water we saved earlier for a few minutes, so that they remain soft. 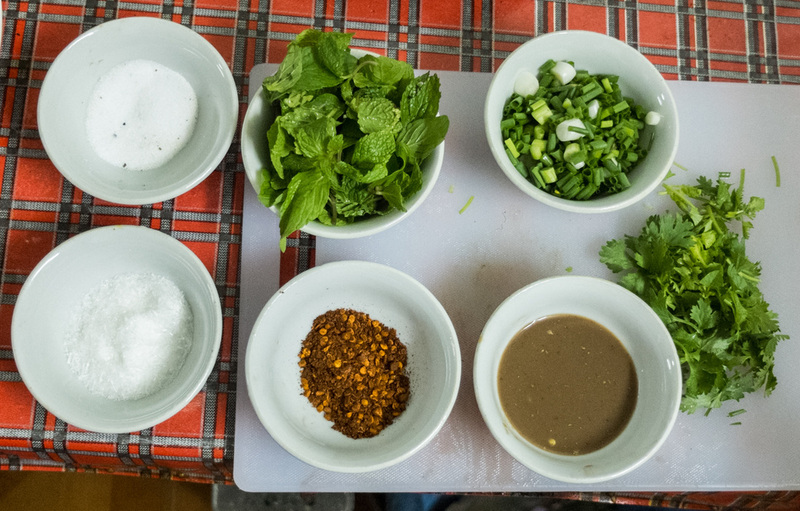 Transfer the cooked meat and liver on a serving plate and add all the herbs and spices (mint & coriander leaves, spring onion, red onion, lemongrass and a tsp of chili), 2 tbs of fish sauce and lime juice. 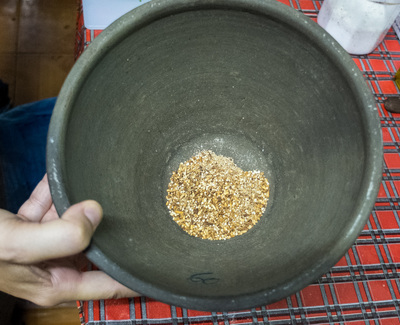 Mix well and only then add toasted rice powder. (If you add it earlier, it will soak up all the lime juice and fish sauce, spoiling the dish). For a final touch, add salt and pepper to taste or even extra lime juice if you like and your dish is ready.